Can this passive cooled GPU take the fight to the budget gaming graphics cards? You can tell the Sapphire 5550 Ultimate isn't a high-end graphics card from the off; the box isn't a ridiculous size. As the name suggests, it slots neatly between a 5870 and 5450 and offers a DX11 card at a budgety price. Performance is mediocre. On our beefy test rig it ran DiRT 2 at 1680 x 1050, with all the frills turned on, at 13.4fps. The same system sporting a 5870 managed 51fps. Far Cry 2 managed 16 against 77 and Just Cause 2 dropped from 50 to just 6fps. Perhaps at under a third of the price we shouldn't be too surprised. We had to drop the games to 800 x 600 and turn off the fancy stuff to get a decently playable frame rate, if you think 40ish frames properly playable. 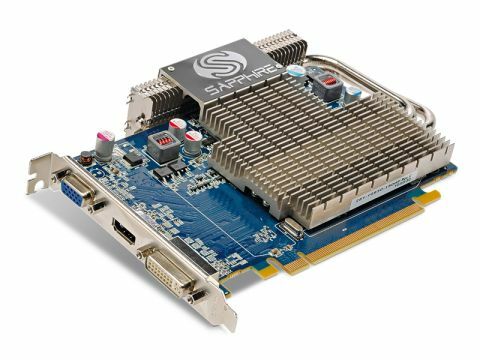 Modern game engines are so effective that even such a modest card still looks pretty good, but only if you don't know any better. Its claims to be a DX11 gaming card don't really cut much ice. The 'Ultimate' part of the tag denotes the passive cooling, although the box does say that the "use of a fan inside the system case is required". So you still need to keep air moving mechanically somewhere. In our test rig, open to the air, it reached 80º. The 5550 ticks all the DX11 boxes, is CrossFire-compatible, and can make a reasonable fist of undemanding jobs, but it's neither one thing nor the other. It's not got efficient enough passive cooling for media players, it's not got enough gaming oomph for 'proper' gaming, and it isn't cheap enough to be a real bargain. We're not sure, in other words, who would really want it.